1. If you missed this interview with Spike Jones, Dave Eggers and Maurice Sendak in Newsweek about the film version of that childhood classic, Where The Wild Things Are, it’s a must. Sendak is priceless! 2. One of my favorite new (to me) blogs is Katy Keim’s Book Snob. Her detailed and funny reviews make you want to leap out of your chair and buy them. On the strength of her latest review, I’ve already put The Last of Her Kind on my list. 5. If you haven’t seen it (and call still stomach reading anything about Roman Polanski), here’s Calvin Trillin’s hilarious satirical poem in The Nation. 7. My take on what American Conservatives could learn from British Conservatives. Well, I’m back from Scotland, a place where they really do say “wee” for “little” and “aye” for “yes” and eat (gulp) haggis (end gulp). One of the things I like most about living in London is how easy (and cheap) it is to leave. All of Europe – plus Northern Africa, the Middle East, and Central Asia – is just a few hours away by plane. When we first moved here, I wasn’t sure how much of these we’d actually manage to squeeze in. (Answer: more than I expected, largely due to my new found stint as a travel writer.) But even if we hadn’t ended up traveling all that much, what really appealed to me was the idea that I could leave if I wanted to. In other words, it wasn’t the actual movement that attracted me; it was the possibility of movement. I realized, as I thought about it, that she was absolutely right. It explains why I jumped at the possibility of moving overseas. It explains why I like to change careers. And it also explains why I used to have a lot of trouble committing to long-term relationships. This isn’t, actually, how most people approach their lives. I know lots of people whose sense of security is derived from living in the same neighborhood over time…hanging out with the same group of people into adulthood…staying with the same job or company over their career. There is something about familiarity and routine that they find reassuring and predictable and it makes them happy. But in my case, paradoxically – and for all sorts of complicated psychological reasons that I won’t bore you with but which have, rest assured, have been amply explored elsewhere – I actually feel safer when I know that change is on the horizon (or at least potentially so). And so I’ve come, belatedly, to embrace this part of my character rather than just assuming, as I did for so long, that I’d eventually “grow up and settle down.” Because for better or for worse, this is who I am. Which is a long way of saying that growing up is a really complicated thing to figure out. And you just hope that every so often, you bump into someone – it might be that random Jungian you interviewed and never saw again – who helps you make sense of it. In the meantime, thank goodness I can begin planning that next trip to Munich…. Speaking of expat living, I was delighted to discover, courtesy of Freakonomics, that living abroad gives expats greater creativity in problem solving. 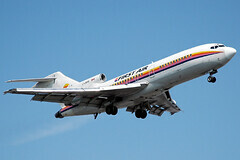 Image: First Air 727-100 by caribb via Flickr under a Creative Commons License.